Sometimes you just get tired of the normal roasting methods you always use and find yourself wanting to step it up a little. While walking through the meat section of the grocery store this week, my husband and I saw a pork loin and decided to try a stuffed loin recipe. 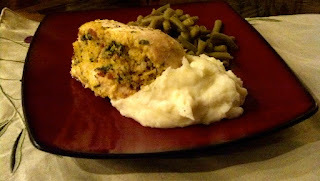 We used a stuffing similar to that use for Cornbread Stuffed Chicken, but with a few changes. 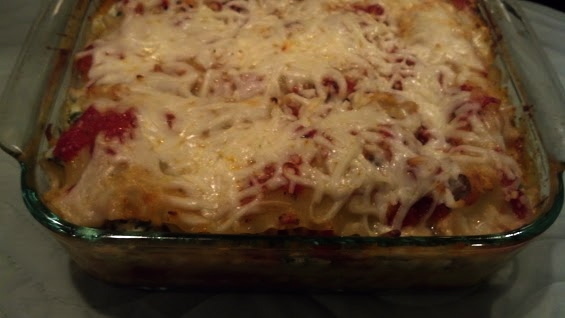 This recipe turned out great! What I really like is that all of the prep can be done ahead and then you can leave it wrapped in the refrigerator for a few days until you are ready to cook. 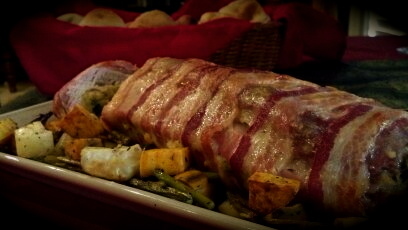 I served this with a medley of roasted vegetables. 1. Melt butter in a saucepan over medium heat. Add the onion, garlic, salt and pepper. Gently cook until tender; approximately 5 minutes. 2. Crumble the cornbread into a large mixing bowl. 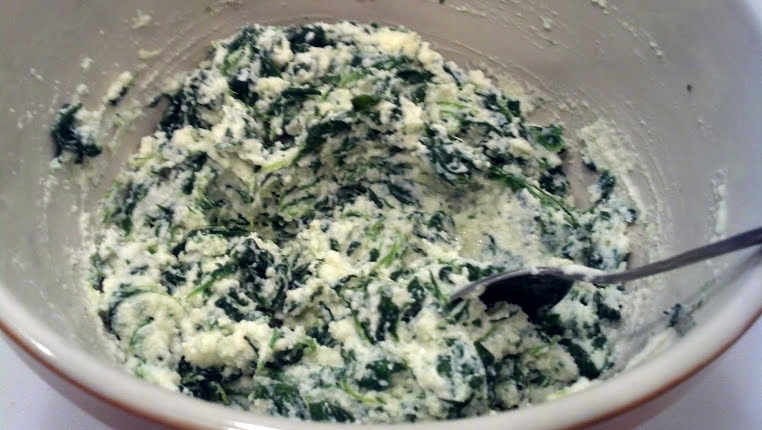 Add the onion/butter mixture, drained spinach and egg. Stir to combine. 3. To prepare the loin, run a long knife down the length of the meat without going through the back 1/2 inch of the loin about a third of the height down. Fold the flap open and then repeat going the other direction and folding open. You will have filleted the meat into a pamphlet style. If you have judged the thicknesses correctly, you will have a consistent thickness throughout. 4. Sprinkle the interior of the loin with salt and pepper. Cover the interior with the prepared stuffing, using your hands to press it down. 5. 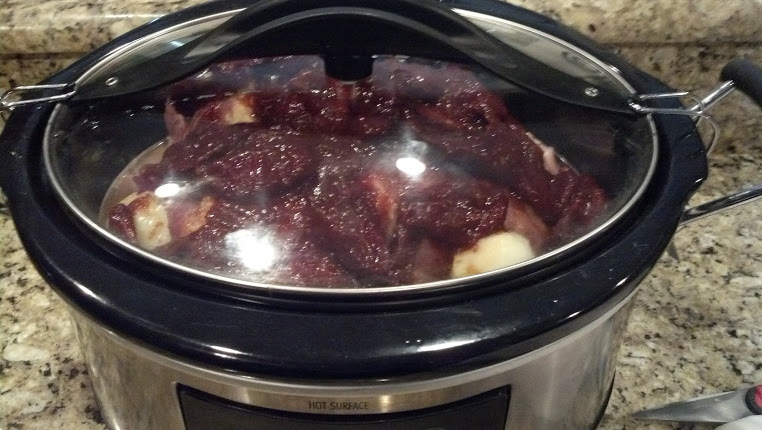 Fold the loin back together, pressing down as you go to get a tight roll. 6. On a large piece of plastic wrap, lay the bacon strips out. 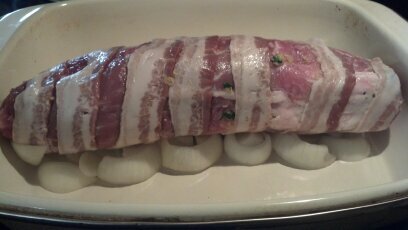 Place the rolled loin on the strips. 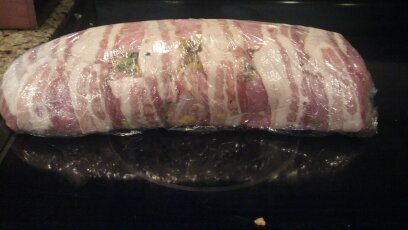 Fold the bacon over the loin and then tightly wrap with plastic. 7. Place the loin in the refrigerator for at least 1 hour. When ready to cook, remove from the refrigerator and allow to come to room temperature for 20 minutes on the counter. 8. In a large roasting pan, place sliced onion in a bed, mounded to be under the cooking loin. Place the loin on top of the onions, seam side down. 9. Tightly cover the roasting pan with foil. 10. Cook the loin for 1 hour, covered. After 1 hour, remove the foil and allow the bacon to crisp; approximately 20 minutes. 11. Check the internal temperature of the loin. When it has reached 165 degrees, remove from the oven and allow to rest in the pan while covered by foil for 20 minutes. 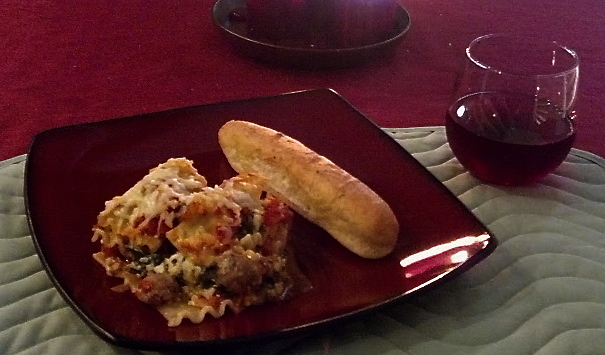 The only introduction this recipe needs is one word.....Delicious! I hope you enjoy. 1. In a large pan, simmer the butter, apples, sugars, cinnamon and nutmeg over medium low heat for 20 minutes or until cooked through and tender. 2. Add flour; stir. Cook for 2 minutes, to thicken. Remove from heat and allow to cool. 3. Prepare a glass bottom pie pan (8 or 9 inch) by layering one of the crusts on the bottom. 4. Pour the cooled apple mixture into the bottom crust, mounding more in the middle. 5. 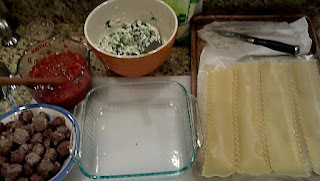 Place the top crust over the pie and crimp the edges to close. Cut vent holes into the crust to allow steam to escape. 6. 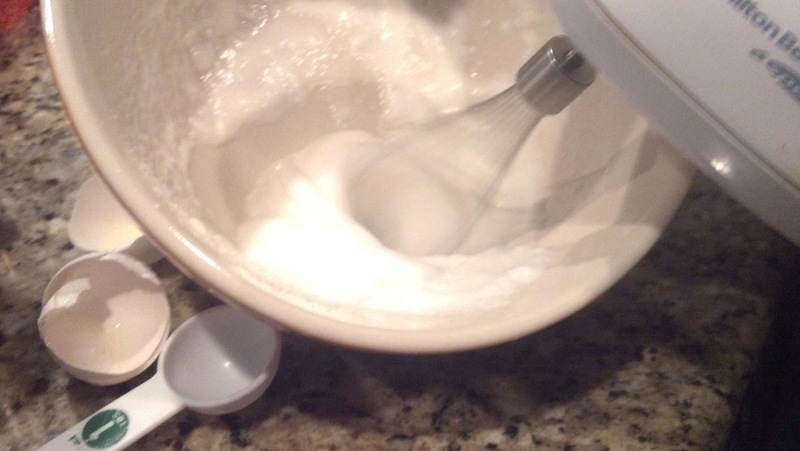 Create an egg wash by beating the egg and water together. Lightly brush onto the top crust. 7. Bake for 15-18 minutes, watching closely. You only have to bake until the crusts are brown and cooked as the filling is already completely done. If your edges begin to cook too fast, cover them with aluminum foil and allow the top to brown to the desired golden color. 8. Allow to cool for a couple of minutes before slicing. 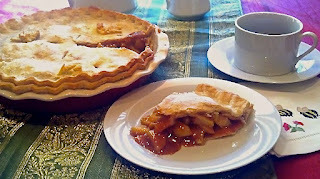 Note: I love to make homemade pastry, but I will be honest, there are times when I just don't have the time. I have found that the rolled crusts found in the refrigerated section are perfectly fine. Just make sure to allow them to come to room temperature for 25 minutes on the counter before using. Do not use the microwave technique found on many packages; this technique makes the dough gummy! 1. In a food processor fitted with the blade attachment, combine flour and salt. Add the butter to the flour and pulse until the mixture looks like course sand or peas. Slowly steam in the water to the running processor. You may not need all the ice water; you just want to add enough until the flour mixture comes together as a ball. 2. Remove from the processor onto a lightly floured board. Roll into a ball and cut in half. Wrap the individual dough balls in plastic wrap and refrigerate for 15 minutes. 3. When ready to use, remove from the fridge and roll on a lightly floured surface. All too often we all get wrapped up in the commercialization of Christmas and forget about the wonderful gifts that come straight out of our kitchens. I know for my family and me, homemade gifts extend an even warmer thoughtfulness and a deeper level of appreciation than most gifts that can be purchased from a store. Part of my Christmas tradition is making candy. Traditional candies coming from our kitchen include walnut fudge, chocolate dipped pretzels and peppermint bark. I also throw in other baked goods including cookies and breads. This recipe was actually born out of a mistake in which some cheesecake fudge did not set up firm enough and I suddenly was left wondering what to do....so I grabbed some powdered sugar and rolled them into cheesecake truffles. Everyone I gave them to loved them! 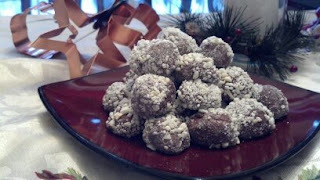 So I took the newly morphed recipe and created the White Christmas Truffles. This recipe is very versatile. Be warned though....they are rich and addictive! 1. In a large pot over medium low heat, combine butter, milk, semi-sweet chocolate, and salt. Stir continuously until melted and smooth. 2. Add pudding mix and continue to stir constantly for 3 minutes to allow the pudding to dissolve into the chocolate. 3. Add the marshmallow fluff and stir until the ribbons of white disappear and the entire mixture is consistently smooth and brown. 4. Carefully pour the mixture into a 9x9 dish lined with wax paper. Place in the refrigerator for at least 2 hours. They have to become completely cooled and set in order to roll. The timing will differ based on your refrigerator setting. 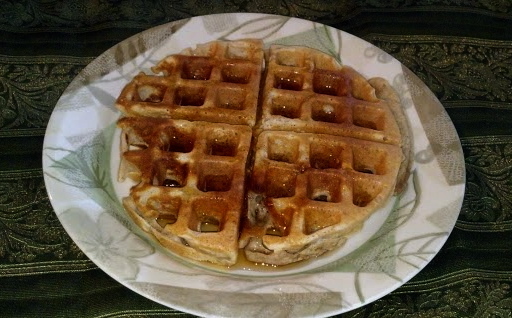 I have actually allowed them to cool overnight and had great success. 5. In a food processor, grind the white chocolate chips until flaky. Pour into a shallow dish. 6. Once the chocolate mixture has finished cooling in the fridge, remove and scoop teaspoon sized pieces and roll between your hands into a ball. You will want to work fast as to not melt the truffle with the heat from your hand. Roll the truffles in the flaked white chocolate. 7. Arrange the rolled truffles on at cookie sheet and place in the freezer for 3 minutes to firm up. 8. Arrange the truffles on a serving dish or gift container. Enjoy! Note: These candies need to be stored in the refrigerator and will be good for at least a week. Do you ever crave something sweet but there is nothing in the cabinets and no mix to be found? This brownie recipe is much easier to throw together than my normal because there is no melting of chocolate to make the batch. These can be customized with nuts, flavored candy chips, chocolate covered mint chips, or anything else. 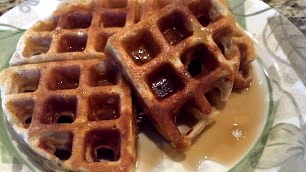 They would also be great with some caramel drizzled throughout them......yum! I always like mine hot with a nice scoop of ice cream. Keep this recipe handy in case you suddenly need to make a dessert for unexpected guests during this holiday season! These are warm, crusty on the outside and gooey in the middle.....perfection! 1. In a large bowl, combine oil, sugar, eggs and vanilla. 2. Combine the salt, baking powder, cocoa, and flour. Gradually whisk into the wet ingredients. 3. Add the chopped baking chunks to the batter. Stir to combine. 4. 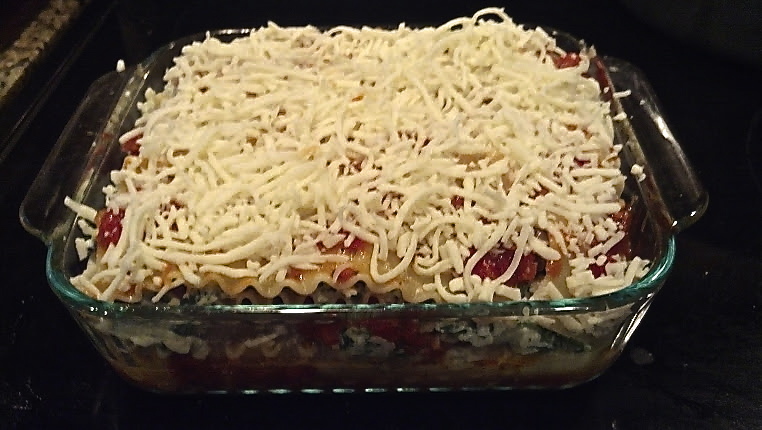 Place in a 9x9 baking dish coated with butter or non-stick spray. 5. Bake for 20-25 minutes or until set and pulling away from the sides. 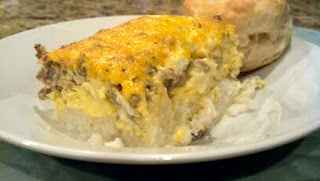 This casserole is very similar to one of the quiches I make for parties and special breakfasts. Tonight I wanted to make something different but really did not want to deal with making dough. Instead of a pastry crust, the egg layer is placed above cooked grits. The ingredients inside the egg layer can be customized to suite your taste. If you want it spicier, use hot sausage. You can also make this recipe vegetarian, as I do with my spinach quiche, and add sautéed vegetables. This is merely a technique; once you know what you are doing, this can be morphed into endless possibilities. 1. Use 1 Tablespoon of butter to grease the inside of a 5x9 baking dish. Make sure to get the bottom, sides, and corners well. 2. In a medium saucepan, bring 2 cups of water to a rapid boil. Slowly add the quick cooking grits to the water while whisking. Reduce heat and cover. Cook for 3-5 minutes or until creamy. 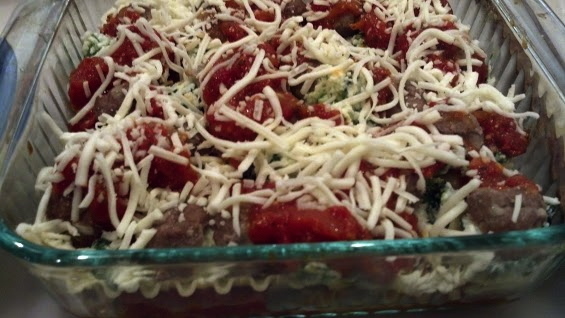 Pour into the prepared baking dish and allow to cool while getting the rest of the recipe together. 3. Heat a small skillet over medium heat and cook the sausage. Using a spatula, break the sausage apart as it cooks until you have small crumbles. Cook for 5 minutes. Using a slotted spoon, remove the sausage and place into a bowl to cool. 4. Place the finely chopped onion into the pan to cook in the remaining sausage drippings. Cook for 3 minutes while stirring. 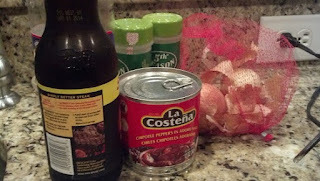 Pour the softened onion into the sausage and stir to combine. Sprinkle the sausage and onion mixture evenly over the grits. 5. 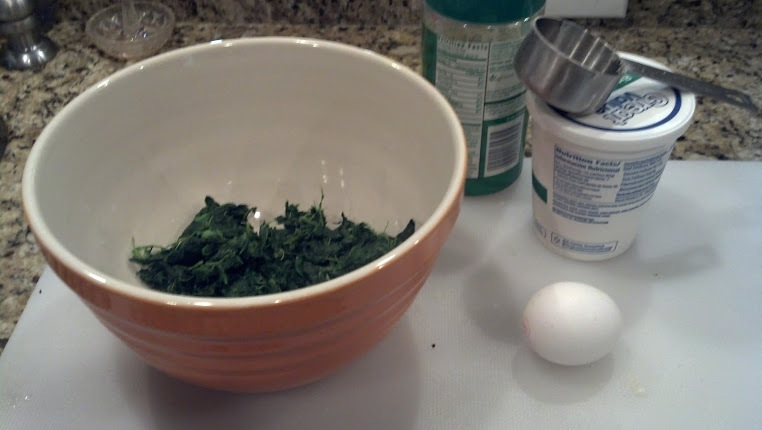 Whisk together the eggs, milk, and desired amount of salt and pepper. Pour over the sausage layer. 6. Top with grated cheddar. 7. Bake until cooked through and the egg layer is set, approximately 35-40 minutes. You do not want it to become brown, just cooked through and thoroughly set in the middle. 8. Allow to sit for 2 minutes and then slice and serve! Note: If you want an extra layer of flavor, add butter and/or cheese to the grits before adding them to the baking dish. As Christmas nears, there are tons of social gatherings to take homemade baked goods. My husband requested bite size cherry pies for a party tomorrow night. After making cupcake sized pies, I still had some leftover filling and dough. 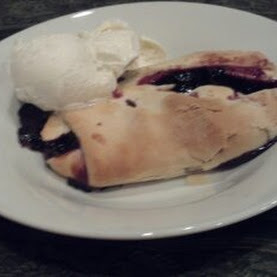 Instead of wasting it, I made individual pastry pockets for a nice dessert after Sunday dinner. The filling for the pies is made using dark cherries and orange zest; this combination is very different and much more complex than the typical cherry pie filling that comes from a can. 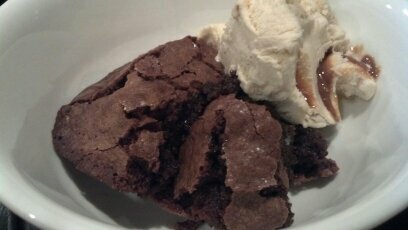 Be warned....this is decadent! There is no room for the timid here. In a large saucepan, combine all ingredients except corn starch and butter. Simmer on medium-low for 40 minutes, stirring occasionally. Slowly add in the corn starch, stirring rapidly to avoid lumping. Melt in the butter and then allow the sauce to cool. On a lightly floured pastry mat, unroll the room temperature crusts. Cut each crust into quarters. Place the dough on a baking sheet lined with parchment paper. Fill each pastry with 3-4 Tablespoons of filling, distributing evenly among the 8 pies. 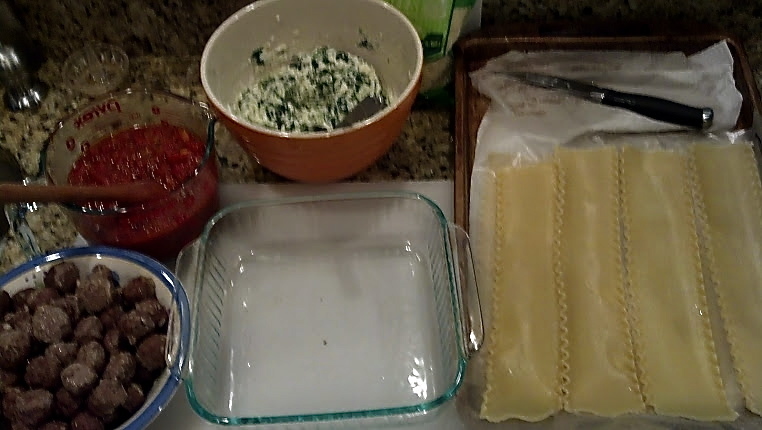 Make sure to place the filling in the middle of each pastry to allow for folding. 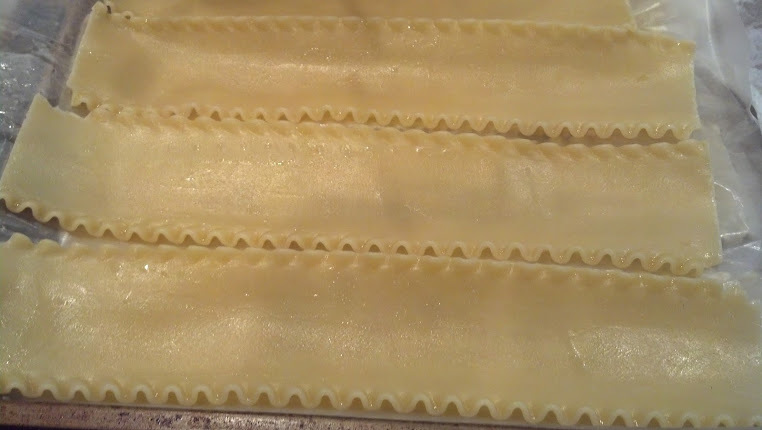 Fold in opposite sides of the crust, tucking in the corners as you go; repeat folding the other way to create a little box around the filling. Gently slice 2 vent holes in the top of each pie to allow for the steam to escape. Bake at 425 degrees for 20 minutes or until golden. Cool for 5 minutes and then serve with whipped cream or ice cream. I love French toast....Can I say it again? I mean, I LOVE FRENCH TOAST! The thick bread covered in a rich custard, over-flowing with cinnamon flavor and cooked until crisp in butter. I mean, what is not to love? This time of year, I also LOVE apples. 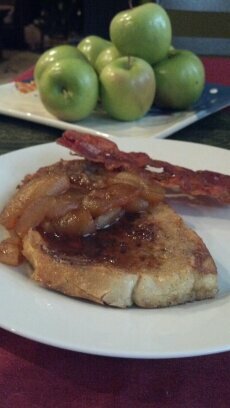 So what better to top delicious French toast with than syrupy cooked apples? Nothing! This recipe is perfect for Christmas morning and is great for crowds as you can make the apples ahead of time and simple reheat and then be making the French toast on a large electric griddle. This is a keeper for any recipe box! 1. Cut the apple into slices approximately 1/4 inch thick. 2. 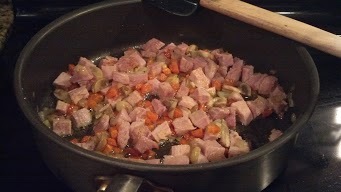 Combine all ingredients in a small saucepan and cook over medium low heat for 15 minutes, stirring occasionally. 1. 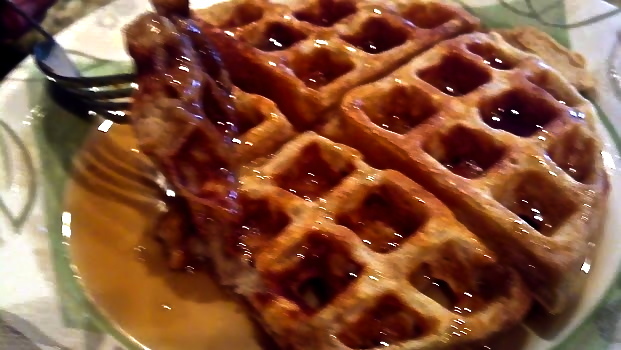 Combine Eggs, Sugar, Cinnamon, and Milk in a shallow dish. 2. Place the sliced bread into the custard mixture allowing to soak for 1-2 minutes per side. While the bread is soaking, melt the butter in a skillet over medium heat. 3. Place 2 pieces of bread in the skillet at a time, making sure not to overcrowd the pan. Allow to cook 3-5 minutes per side, or until golden. If the bread is cooking too fast, reduce the heat. You want to make sure the bread cooks throughout because of the absorbed custard mixture. You might want to add additional butter to the pan to cook the remaining pieces. 4. Serve hot covered in the cooked apples. Make sure to drizzle the extra cinnamon-apple syrup over the toast....no point in wasting something so delicious! This recipe was born out of necessity. Necessity to use up chicken thighs and extra crackers. Necessity to have a no-fuss meal. Necessity to make something different yet special. 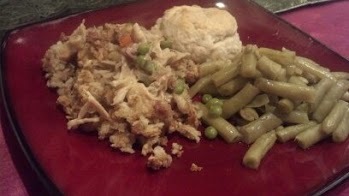 This meal was really created for my husband who loves fried chicken and stuffing with gravy. Most of this meal is prep and then forget it, which is great for a busy household. Although it looks like a lot of steps, the timing works out so that everything is finished at the same time, which in my household is a wonderful thing! 1. 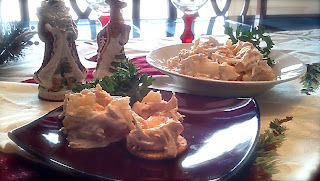 Create an assembly line with one container holding the two beaten eggs seasoned with pepper and garlic powder, another with crushed crackers and then the final resting place for the baking chicken, a wire rack over a cookie sheet both sprayed with non-stick spray. 2. 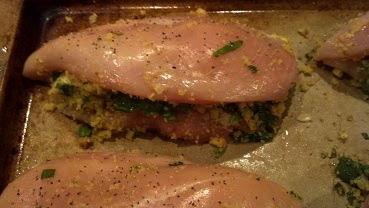 Dredge the chicken through the egg mixture and then toss in the cracker crumbs. You might need to press the crackers into the chicken a little to get a nice coating. 3. Place the cracker-coated chicken thighs onto the baking rack. 4. Bake in the preheated oven for 50 minutes or until cooked throughout and golden brown. While the chicken cooks, make the dressing. Note: You can also do this with any cut of chicken you desire. I just happened to have thighs on hand. 1. In a fry pan, melt 2 Tablespoons of butter. Add the chopped onion and garlic cooking until tender, about 5 minutes over medium heat. Allow to cool. 2. 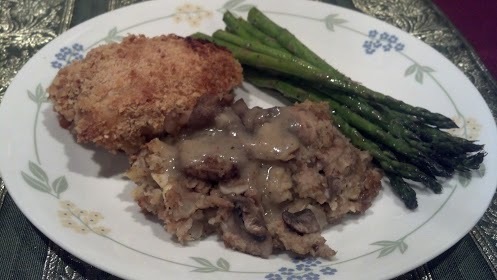 In a large bowl, combine stuffing crumbs, 1 beaten egg, sliced mushrooms, broth, pepper, and sautéed onion and garlic. Stir until everything is moistened. 3. 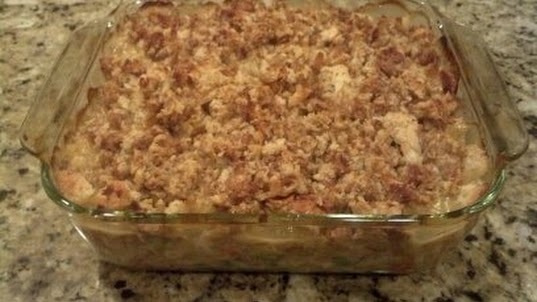 Evenly spread the stuffing mixture into a 9x9 baking dish that has been sprayed with non-stick cooking spray. Cover with foil. 5 minutes before the chicken and dressing are ready, stir up the quick gravy. 1. Melt butter in a small skillet over medium heat. 2. Add the flour, salt, pepper, and poultry seasoning, stirring with a whisk. Allow to brown for 2 minutes. 3. Slowly whisk in the chicken broth. 4. Allow to simmer on low for 5 minutes, stirring occasionally. When I am traveling, I like to eat quick meals at unique places. One day while driving down the interstate, I decided to stop at a well-known deli for lunch. I ordered what I thought was going to be a typical chicken salad sandwich, only to be pleasantly surprised to receive a wonderful salad filled with pineapple. I immediately loved the sweetness of the pineapple with the creaminess of the mayonaise based salad all contrasting with the vine rippend tomato, buttery leaf lettuce, and crunchy wheat toast. While low on ingredients, this salad is over-the-top on taste. I think what I like the most is the simplicity. No ingredient overpowers another yet they all work together to create a perfect balance in your mouth. This recipe is a great one to have in your pocket for using up leftover roasted chicken breast, serving at holiday gatherings, or just as a lunchbox staple. You can also add chopped celery or toasted slivered almonds, if you like, but I really enjoy the simplicity these few ingredients offer. 1. Roast a large bone-in, skin-on chicken breast that has been rubbed with canola oil and sprinkled with salt and pepper in a 350 degree oven for 30 minutes or until the juices are clear. Allow to sit at room temperature until cooled. 2. Remove the skin and bones from the chicken breast. Using your fingers, shred the chicken into a large bowl. 3. Add the mayonaise, drained pineapple, and salt/pepper. Stir to combine. Taste and add more salt and pepper as you desire. 4. Refrigerate covered until ready to use. 5. Serve with crackers as a appetizer or as a sandwich/wrap. I have finally gotten my Facebook page up and running. It is still in its very primitive stages, but I hope to have it fully complete soon. Make sure to like the page, MSC on Facebook, as well as subscribe to the blog to be the first to know about new recipes. I also want to hear from you guys. If you try a recipe, please make sure to come back and comment on the post. Additionally, if there is something that you would like to see, comment on the Facebook page and I will try to do a MSC twist on your request. Finally, I want to thank all of you for your support of MSC and the kind words of encouragement. I love to bake and cook so this is HEAVEN for me. The greatest thrill for a MSC is entertaining and sharing delicious food with others; this site is an extension of that passion for me. At our favorite brewery, they have an appetizer of pale ale battered asparagus. After trying it, I was hooked! 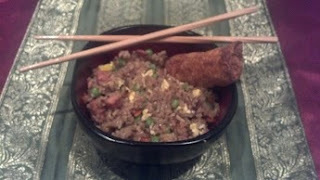 I love the tempora-like batter over the tender stalks. The key to the batter is to use a light colored ale; I happened to use an IPA. The dipping sauce is creamy, garlicy, and surprisingly light (thanks to the lemon). These are great for parties! Make sure to use tender, young stalks for best results. I served these as a side for an alternative to the typical french fry. Combine all ingredients for the "aioli" and allow to sit for 1 hour in the refrigerator, covered. 1. Combine the flour, salt, and baking powder. 2. Using a whisk, slowly add the beer and water while stirring constantly. You might have to add a little more water depending on the dryness of you flour. You want a pancake batter consistency. 3. Allow to sit for 10 minutes. 1. Preheat you fryer oil to 375 degrees. I use vegetable oil but you can use whatever flavorless oil you prefer. 2. Wash 1 pound of asparagus. Snap the stalks to remove the rigid portion of the stalks. 3. Dredge each stalk through the batter while holding on one end. Place immediately into you fryer and cook until golden brown. This goes really quickly, about 90 seconds to 2 minutes is all it takes. You will have to fry in batches as you do not want to drop the oil temperature too much. 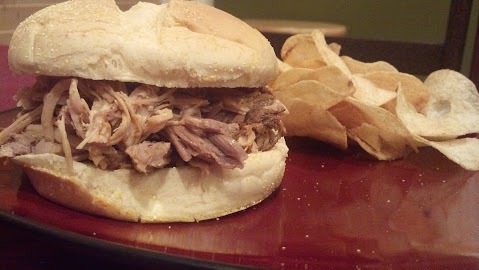 About 10 stalks at a time is all that I recommend in a deep fryer. 4. Remove to a paper towel lined plate or baking sheet. Serve hot with you aioli for dipping. There is a spicy chicken wrap that I love to get for lunch from a local fast food chain. After paying quite a bit for these wraps, I thought, "Why am I paying for this when I could just make my own?" Part of being a successful home cook is managing the finances and keeping even the lunch box interesting. 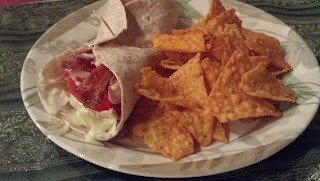 This wrap can be customized to include the toppings of your choice. This recipe beckons to a cajun chicken club, which is exactly how my husband decided to eat his. The great things is that this recipe is versatile! You can add guacamole, sliced cucumber, ranch dressing, anything you desire; you can even slice up the tenders and put them atop your favorite salad, maybe even with my Heavenly Dressing. No matter how you serve them, you will not be disappointed! 1. 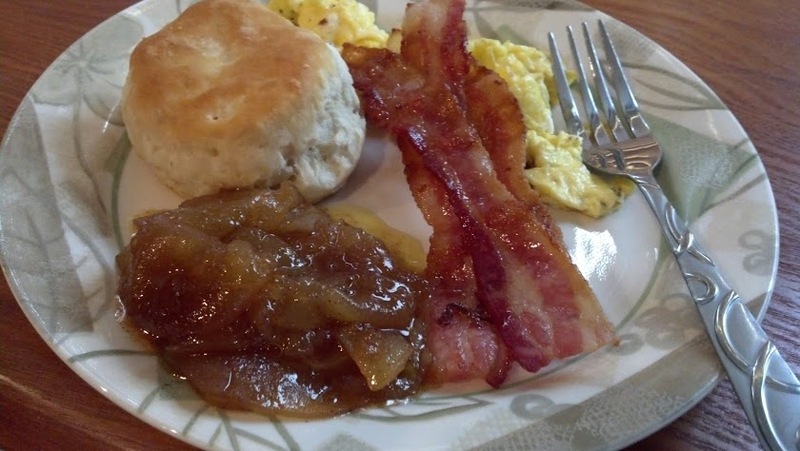 Place the uncooked bacon on a broiler pan and cook in the oven at 375 degrees for 7-10 minutes or until crisp. (You can also cook the bacon on the stove top and then just drain on paper towels.) Remove from oven and allow to cool while the chicken cooks. 2. In a small bowl, combine salt, pepper, garlic, paprika and cayenne pepper. Sprinkle over both sides of the chicken tenders. 3. Heat a grill pan over medium heat. When hot, place the chicken tenders into the pan. Cook for 8-10 minutes on the first side or until golden and cooking through. Turn and cook for another 5 minutes on the second side. 4. Heat the wraps for 15 seconds in the microwave right before use. 5. To assemble, I layered leaf lettuce, sliced tomato, 2 strips of chicken, 2 strips of bacon and a drizzle of honey mustard. Roll the wrap tightly and enjoy! I love to bake. I actually have my own baking business, Sweet Somethings, where I do cakes and other desserts. Recently, a wonderful coworker at my daytime job gave me a fresh pineapple from Hawaii on the one condition that I must make something and post it on my blog. 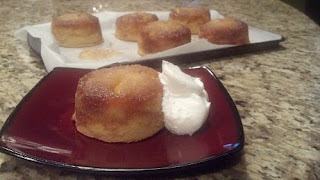 My solution....mini pineapple upside-down cakes. I like mini-cakes because it allows my husband and I to have a small dessert but they are also easily transported to share with others. 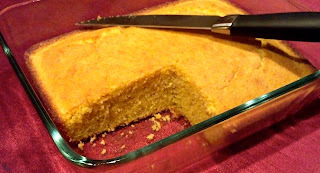 This is simply a classic dessert in the South made small. 1. Preheat Oven to 350 degrees. Spray a large muffin tin with non-stick spray and set aside. 2. Melt 1/2 stick (4 Tbs) butter in a microwave safe bowl. Add the brown sugar and mix to combine. Distribute the butter/brown sugar mixture evenly into the 6 oversized muffin rounds. 3. Place the pineapple into the butter/brown sugar mixture. This will allow the cake to be poured on top. When you flip the cakes out, the pineapple will be on top. 4. 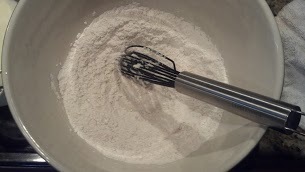 In a large mixing bowl, cream the 1 stick of softened butter with 1 cup sugar. Do not rush this step. This will take about 3 minutes on medium speed. 5. Add the eggs, one at a time, allowing each to incorporate fully. 6. In another large bowl, combine the flour, salt, and baking powder. 7. In a measuring cup, measure the milk and vanilla. 8. Alternate adding the dry and milk mixtures to the butter/sugar/egg bowl, stirring well throughout. 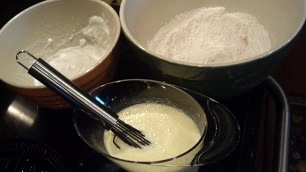 Always end with the milk mixture to ensure the creamiest batter. 9. Distribute the cake batter evenly among the 6 tins. I like to pour mine into a very large measuring cup and then into the baking tins. 10. Bake for 30 minutes or until golden brown and cooked through. 11. 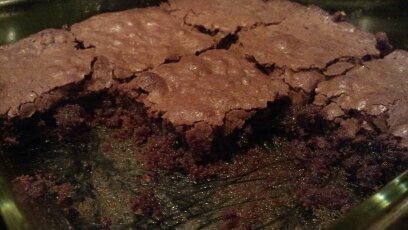 Allow to cool for 2 minutes and then flip out onto a baking sheet. Do not allow the cakes to cool completely in the baking tins or the topping will stick.